Because of their genes, some people come into the world either as a lark (early riser) or a night-owl (late sleeper). In addition, however, even in normal people, such ”chronotype“ changes with age. Starting at puberty they develop into revellers. At the age of 20 a change occurs and the sleeping and waking rhythm shifts continuously in an earlier direction, until in old age we suffer from early-morning senile insomnia. Factors in the circulating blood could be responsible for these changes in the internal clock. Fig. 1 The suprachiasmatic nuclei (SCN) The main components of the circadian system of man are the retina, the retino-hypothalamic tract, the pineal gland (corpus pineale, secretion of melatonin) and the suprachiasmatic nuclei (SCN, the “master clock” in mammals). The endogenous clock is regulated by a synchronisation, which is strongly dependent on the fall of light onto the retina. In mammals, biological clocks control a variety of daily rhythmic processes such as sleep, body temperature, blood pressure, hormone secretion and digestion. 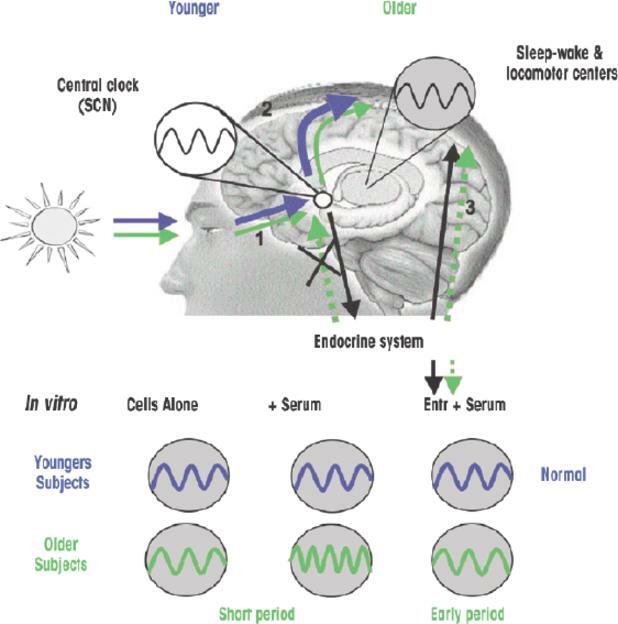 The circadian activity rhythm is controlled by a central clock located in the brain (the circadian pacemaker in the suprachias­matic nucleus “SCN”) (Fig. 1). The SCNs are collections of about 10,000 neurons in the hypo­thalamus above the optic chiasm on either side of the third ventricle. The central clock itself is synchronised by the light that enters through the eyes. 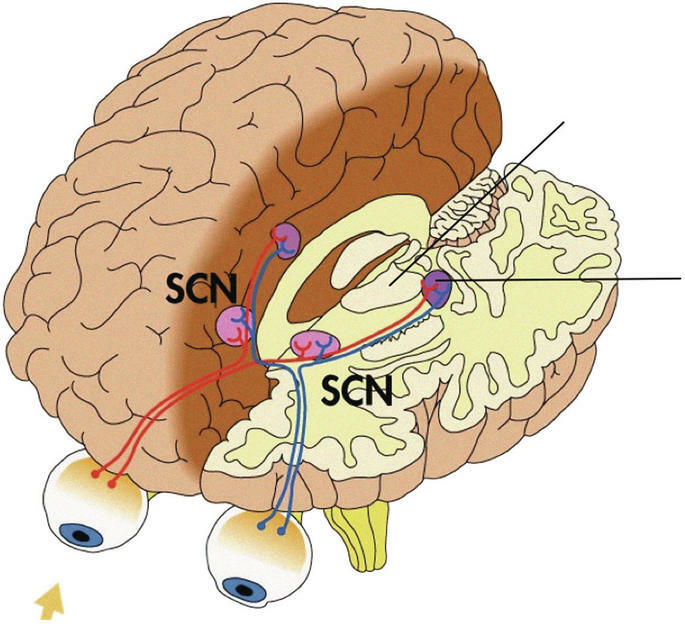 The light influences the activity of the SCN via the specialised retino-hypothalamic tract, which establishes a direct neural connection between the retinal photoreceptors and the SCN. At the same time it communicates with other clocks, the so-called “slave clocks”, which can be found in most of the cells in our body (e.g. heart, kidney, gastrointestinal tract, skin; Fig. 2). All these cells express clock genes (“clock genes”: e.g. Period, Clock), which are important for the circadian rhythm. The clock genes and the proteins encoded by them interact in a complex negative feedback loop to generate cellular molecular rhythms. These are the synchronised biorhythms of activity of various tissues (e.g. 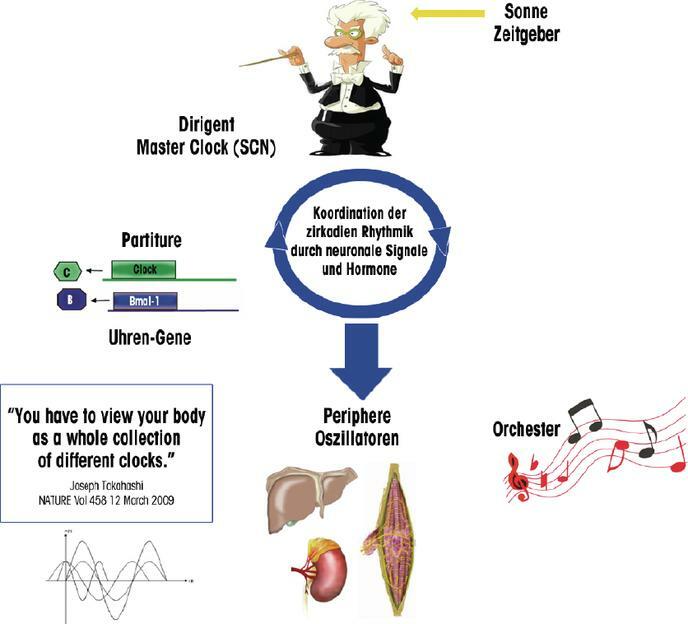 motor activity, body temperature), which work together in harmony – analogous to an orchestra, which produces “harmonious music rhythms” from the different instruments (Fig. 2). Fig. 2 Regulation of circadian rhythms The light (light-dark cycle) is the dominant synchroniser for circadian rhythms, although regular social events and physical activities are important external zeitgebers. The central pacemaker, similar to a “conductor” (“master clock”), is located in the SCN. It synchronises the peripheral oscillators (“slave clocks”) in each organ and each cell, just as a conductor guides his orchestra through the score. This system includes various clock genes or proteins (e.g., the CLOCK and BMAL1 proteins). A circadian rhythm (commonly known as “internal” rhythm or “body clock”) has a period length of approximately 24 hours (Fig. 3). The period length of the body clock depends on the genetic makeup and it is possible to breed organisms which, because of different mutations in clock genes, possess an internal clock with a longer or shorter period length. In the population, two main categories of chronotypes can be distinguished: Lark (“early chronotype”) and owl (“late chronotype”) – some people are frightfully cheery early in the morning, others blossom much later (Fig. 3). Interestingly, the chronotype changes with age, which is especially apparent in teenagers. Starting at puberty, people become true night owls. The turning point is at about 20 years of age. The internal clock then gradually shifts to earlier – even as far as so-called “senile insomnia” (Fig. 4a). Fig. 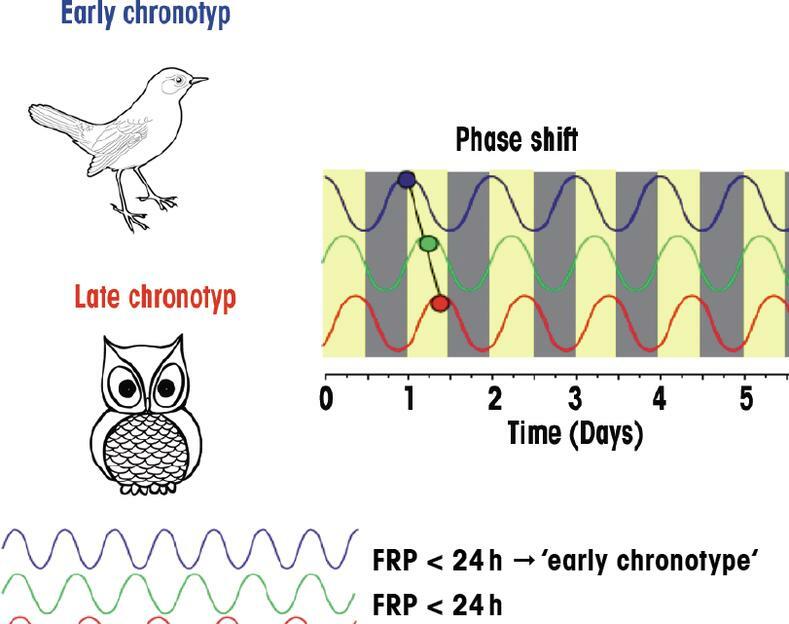 3 The phase shift: advancing the phase of the lark („early chronotype“: from green to blue) and delaying the phase of the owl („late chronotype“: from green to red). Shortening or lengthening of the period length, their cycle in the absence of external stimuli takes about 24 hours (“free-running period”). Coupling of period and phase: individuals with longer period lengths usually show a later phase than those with shorter period lengths. Why does this phenomenon occur with age and what are the causes? This issue was pursued by our team. Due to the fact that a circadian clock exists in most of our cells, therefore also in peripheral cells, a new survey method was used for the extraction and cultivation of peripheral cells of individual subjects in order to determine the molecular genetic properties of the individual clocks. Abb. 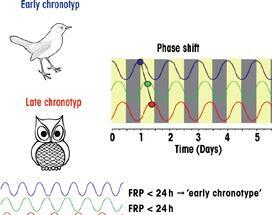 4 A) Change in chronotype with age: From pubertal revellers (owl) to senile insomniacs (lark) (after Roenneberg et al. J Biol Rhythms. 2003). B) Older study participants show a significantly earlier chronotype than younger study participants. 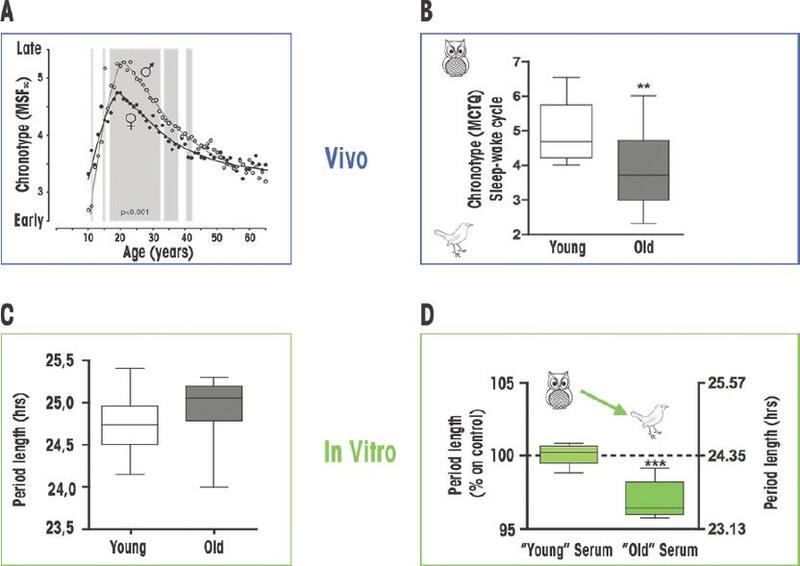 C) Circadian cycle length in fibroblasts from young and older donors was not altered in vitro per se, (standard conditions, foetal calf serum). D) The cells responded by shortening their period length when treated with human serum which came from older people. As part of the study a tiny skin biopsy was taken from 18 young (21 – 30 years) and 18 older subjects (60 – 88 years) (extreme chronotypes of both groups were excluded from participating in the study). The derived human primary culture systems (skin fibroblasts) were modified with a firefly gene in such a way that they emitted light (bioluminescence). Since the expression of the firefly gene is controlled by a clock gene (BMAL 1), the circadian activity could thus be visualised. The individual rhythmic pattern of expression of fibroblast cultures from young and older donors were collected over 5 days. 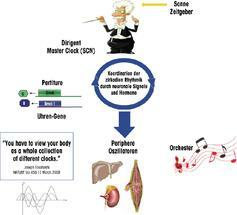 Thus it was possible to analyse individual circadian periods in humans ex vivo/in vitro. We found that, in contrast to the welldocumented agerelated changes in sleep patterns (Fig. 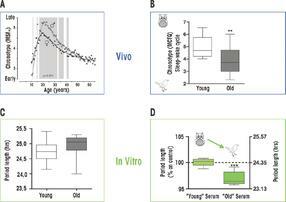 4B), the circadian cycle length in fi broblasts from young and older donors was not altered in vitro (Fig. 4C). Interestingly, this behaviour changed, however, if the same cells – irrespective of whether they were “young” or “old” – were treated with human serum from older people (blood sampling at 2 pm) and not with standard serum (FCS, or fetal calf serum) (Fig. 4D). In analogy to the in vivo data, the cells responded with both a shortening of their period length and a forward shift of the phase (“advanced phase”). However, these changes did not occur when serum from young control subjects was used. In further experiments, the human serum of older donors was heat inactivated. 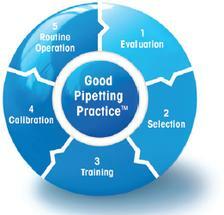 Thereupon a shortening of the period length and an advancement of the phase could no longer be detected in vitro. This suggests that a thermolabile factor or factors which circulate in the blood of older persons is/are responsible for the described effects. Theoretically, this could be hormonal changes which affect the cellular clock in old age. Fig. 5 Model of the mechanisms that may contribute to senile insomnia (after Pagani et al., PNAS 2011). Blue: young people; Gre the elderly. (1) Reduced light levels decrease the Zeitgeber effect of light on the SCN. 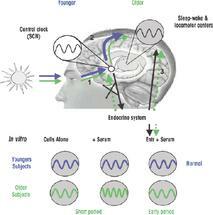 (2) A weak circadian signal of the SCN results in fragmented sleep-wake cycles. (3) Age-related changes in hormone levels can bring about changes to cellular properties and a shift in the early phases in sleep-wake centres, but not directly in the SCN. Various theories have been postulated in the literature to explain the phenomenon of senile insomnia: 1. Fragmentation of the sleepwake cycle, which is associated with increased daytime sleepiness and naps as well as a reduced night sleep leads to a forward shift of the activity phase. 2. Changes in the physiology of the eye – e.g. a lens clouding, yellowing, cataracts and a reduced light sensitivity may contribute to circadian dysfunction in the elderly. With this study, a new additional cellular mechanism is postulated: Circulating factors, probably hormones, which infl uence nonSCN regions of the brain and peripheral oscillators, but not the SCN directly (Fig. 5). Overall, there is convincing evidence for all three models, which can together contribute to the modulation of the chronotype in old age. The last model, however, offers the prospect that possibly the dramatic changes in sleep patterns can be improved by pharmacological intervention. First publication: Eckert, A., Brown, S. A., q&more, 2.2011.